Versailles is such a delight, and even more so when the weather is cooperating. Although clouds loomed on the horizon in the morning, by the afternoon they cleared up to reveal the bluest of skies. It made strolling the grounds of the Petit Trianon and admiring the gardens that much more wonderful. For me, what hammered home the grandeur of Versailles more than anything else was Marie Antoinette's miniature hamlet. Having worked at a toy store for four years or so, I can recognize a toy when I see one. This was a toy on a grand scale for a woman with decadent tastes. fantastic! versailles is heaven : ) cheers! 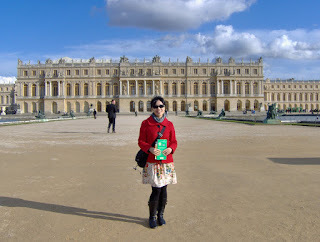 I never did make it over to Versaille when i was in Paris, but lucky you for getting a sunny day! Love your outfit - it's practical and stylish! versailles seemed like a grown-up cinderella's castle to me. i loveddd it and all the history it contains! so beatiful & i hope you enjoyed your trip! I so enjoyed the hamlet! It's beautiful in any weather. I love how your outfit ranges from Canadian Aldo & Jacob to Parisian/London taste, and from Chanel to... MEC!